Standing at her kitchen sink soon after her initial tourist visit to Peru, reviewing images of her many encounters with creative but barely surviving families along the Amazon River, and pondering the challenge of how to assist them in their health, sanitation, nutrition, etc. needs, an idea suddenly struck her– “Buy a Boat!” It was as though a voice inside was telling Gina Low to take a boat up river and ask the people what they thought regarding their problems, needs, and aspirations. The only way to discover the answers was to ask the villagers what they thought. Not willing to make the trip and be unable to provide first-aid where needed, the solution was to purchase a used river taxi, which was converted into living quarters for herself and a crew of local people. The first 2 ½ month expedition led to development of core issues to be addressed by designing an eventual mission statement of APECA, and developing a floating First-Aid station that would remain her home for two years while traveling the Amazon River. Thus began what has become APECA, formed in the USA. Within a year, the Peruvian NGO of the same name took form, with Peruvian members to manage the Peruvian counterpart. APECA has now been in full operation for over twenty three years. During her initial visit Gina had noticed that some adults and children were apparently ill and softly crying in the hammocks of wall-less huts. The guide noted they all had yellow fever, but not to worry because tourists had had their shots. She was not worried for the tourists, but that something to help could have been done if they had been informed of these conditions prior to entering the village. He commented that we would not want to disturb the indigenous healing culture. Once back in the USA her thoughts kept being drawn back to the village, and the complex issues of remote isolated life of a people living in such primitive dangerous conditions; her head and heart could not stop searching for closure. Certainly there was something that could happen to make these circumstances different! As the mother of three children, Gina spent her early adult years in California. Born in Pennsylvania, she lived briefly in Arizona, was educated in the eastern USA, married and moved to California, and eventually returned to CT. In 1993, she began spending most of her time in the remote villages of the Peruvian Amazon providing leadership in the birth of APECA. She claims to be “not a certified anything, but is a registered voter, and that counts!” Many years of volunteer work, some education in Psychology, Social Work, and Emergency Medicine, and parenting three children are strong clues to her interests. Gina says her determination to help the river villagers in Peru grows out of a lifelong interest in preserving traditional medicines and healing skills. As a child, she received the strong influence of her father’s interests and work providing medical services in several American Indian communities. Her work today in Peru reflects his respect for Native healing materials and methods. She began her work surveying village needs and giving first aid services to the people who live beside the Amazon. When necessary, she would transport the seriously ill to Peruvian government hospitals in Iquitos. Over the years she established solid working relationships with the Peruvian government ministries by facilitating their delivery of services to these remote villages. 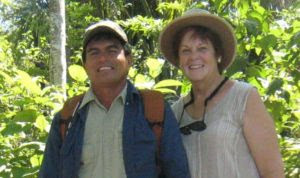 Although Gina took the first courageous steps to establish APECA, using her personal and financial resources and service, today the work depends on participation of international academic institutions, financial donors, volunteers, and individual organizations to help deliver essential services to the rain forest people. Pablo Guerra Gonzales, treasurer of APECA Board of Directors in Peru, and Program Director of APECA in Peru, was born in the area known as Santa Rosa De Shato, where a stream originates and eventually enters the Quebrada Tamshiyacu, a tributary of the headwaters of the Amazon River in Peru. Among his twelve living siblings he is the third child, second son of Olinda and the late Jose who kept a garden in the jungle where they were born. Pablo was raised in a lifestyle dependent on and very respectful of the gifts nature has provided in the rainforest of his ancestors. Traditional foods, natural medicine, and folk lore blended with western medicine, technology and philosophy as he studied in a catholic public school, worked for American and Canadian clergy, and entered the Peruvian Army at age eighteen, where he was trained as a medic. At the age of twenty three he returned to the jungle to start his own garden and family. His strong interest in community made it difficult to refuse frequent requests to serve in leadership positions where he spearheaded the development of a canal transport system and a school for the village where he was mayor. Team work was natural for Pablo in the floating clinic, El Trochero, and as coordinator of development for the building of the study center, El Fundo. Since 1995, he has played major roles as liaison to the villages and as facilitator in the training sessions sponsored at El Fundo. These programs have significantly improved the lives of thousands. His sensitive understanding of his fellow village residents has empowered the grass roots development of APECA in Peru. Holding fast to compassion, his work schedule has been modified over the years. Moving from motorist, to First-Aid provider, to study center constructor, to program director has provided extensive experience. Currently as field director for APECA he develops and initiates sustainable development/education projects, works with bilingual skills at an international level, and, when he has the time, indulges in his passion of advanced woodworking! Pablo Guerra, truly a co-founder, is at the heart of APECA. The programs he leads in the villages and the training sessions sponsored at El Fundo have significantly impacted the lives of thousands. Recently he has been deeply immersed in supervising a Rotary International Project for the building of water collection tanks for several high risk villages.